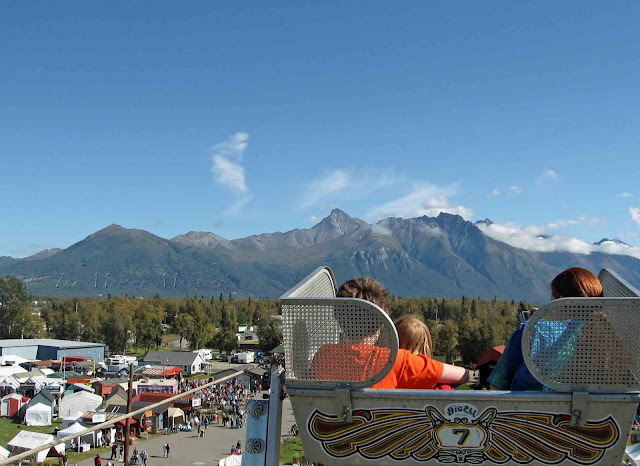 I suddenly realized how silly it is of me to think that Alaska wouldn't have a state fair. Regardless of how far north one me live, everyone is entitled to fried food and overpriced rides! This truly is an amazing view! The Kentucky State Fair is currently going on, as well. Although the food sounds very similar the views are NOT as lovely as yours. We count mullets and misspelled tattoos - highest count wins a deep-fried Snickers bar. Oh I miss the state fair, wish we were there to have joined you! What, no pictures of fair hair?!?! Wow. I just realized that Pennsylvania doesn't have a state fair. We have a plethora of county fairs, large and small. I've never been to a State Fair, and it's been YEARS since I've been to the county fair. I'm due for a return engagement.